Product code: ES3148 Categories: Sold Items, Sold Rings. 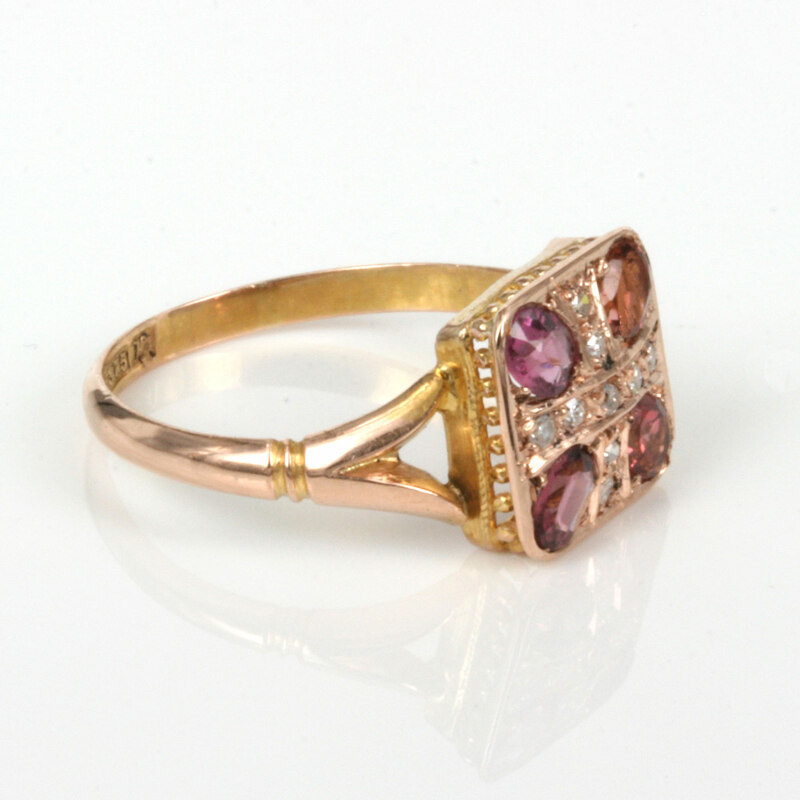 Tourmaline is a precious gemstone that comes in a range of colours and here is a very charming antique tourmaline and diamond ring that was made in 1910 and highlighted with diamonds. Made in Chester in 9ct rose gold, the rose gold itself blends so well with the warm rose colours of the tourmalines and they match so well making it even more elegant on the finger if it was in yellow gold. Rose gold has become more and more popular in recent years and is so often found in antique rings and with this antique ring on your finger it will be so easy to see why. The ring is set with four tourmalines that range from violet pink to apricot and is set with 9 single cut diamonds to add to the sparkle but not to detract from the lovely tourmalines or the rose gold itself. Measuring 10.7mm at the top, the ring also has a lovely split design to the band and beautiful setting from underneath showing just how much detail went into creating this ring over 100 years ago. 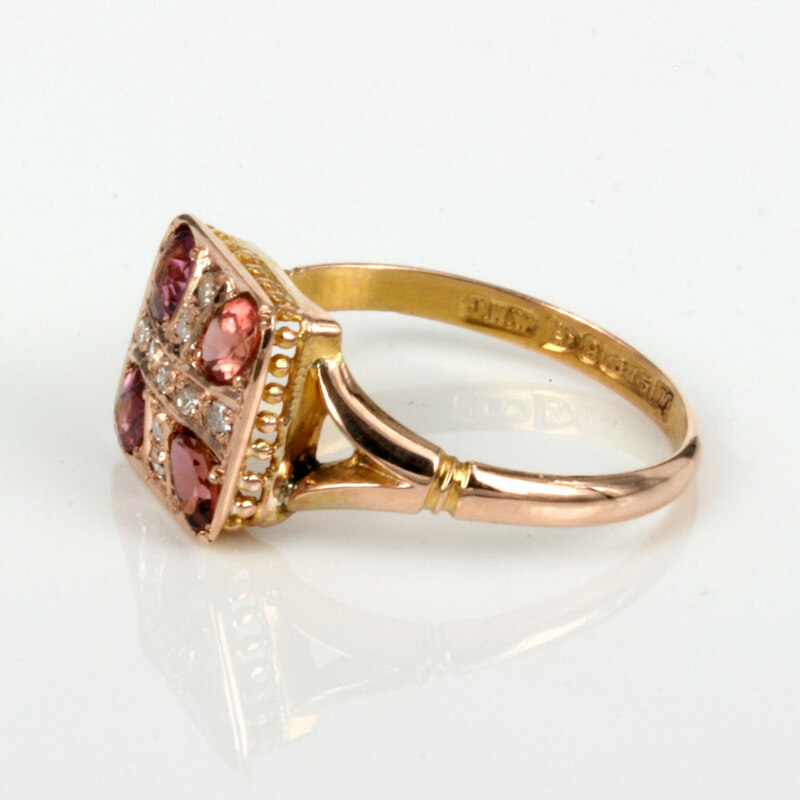 Still in wonderful condition, this antique tourmaline and diamond ring will both delight and impress.